What do we know about literature circles now that we didn't understand eight or ten years ago? What new resources and procedures can help teachers organize their classroom book clubs better? What are the most common pitfalls in implementing student-led discussion groups? And getting beyond the basics, what do mature or "advanced" literature circles look like. In this thoroughly revised and expanded guide, you will find new strategies, structures, tools, and stories that show you how to launch and manage literature circles effectively. Advanced variations are explored and include alternatives to role sheets and flexible new guidelines for their use The second edition includes four different models for preparing students for literature circles using response logs, sticky notes, and newly designed role sheets dozens of variations on the basic version of student-led bookclubs new models and procedures for primary, intermediate, and high school grades new materials for assessing and grading literature circles an inventory of common management problems and solutions new scheduling patterns for group meetings and reading time ideas for using literature circles with nonfiction texts across the curriculum research on literature circles, including correlation with increased achievement on standardized tests explanation of how literature circles match with the national standards for literacy education With detailed examples provided by twenty practicing teachers, Harvey Daniels offers practical and concrete suggestions for each aspect of book club management and proven solutions for problems that arise. Harvey "Smokey" Daniels received all of his degrees--B.A., M.A. and Ph.D.--from Northwestern University, which finally urged him to leave campus and get a real job. He began teaching at Westinghouse Vocational High School on Chicago's West Side, later moving to Lake Forest High School. Smokey is currently on leave from National-Louis University in Chicago to work with schools and teachers around the country on literacy-centered school improvement projects. In these efforts, he serves as a guest teacher in classrooms, leads seminars and workshops for teachers, and consults with school leaders on long-term change efforts. Smokey has authored or coauthored thirteen books on language, literacy, and education. 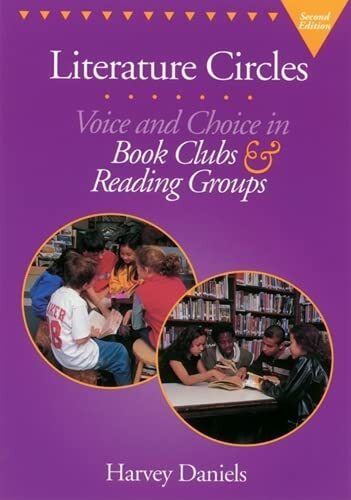 Among these are Literature Circles: Voice and Choice in Book Clubs and Reading Groups and Teaching the Best Practice Way. Smokey has been struck by the range of the "book club boom" that his book helped initiate. "Not only have literature circles spread through U.S. schools," he notes, "they have taken root in schools around the world, including Japan, where there is no cultural precedent of adult reading groups to build on. In fact, some Japanese parents are now learning about book clubs from their school age kids and starting reading groups of their own. That's pretty amazing." After living in Chicago for many years, Smokey and his wife, Elaine, recently moved to New Mexico where they enjoy seeing the sky again, walking the desert at dawn, and hoarding green chili peppers for the winter. What's The Next Big Thing With Literature Circles?